Abra-zine! which is a play on the terms "Abracadabra" and "Magazine" is a seasonal E-mag that spotlights the magic of creativity and inspiration! ABRA-ZINE IS NOW CALLING ARTISTS & CREATIVE FOLK OF ANY KIND! Painters, photographers, cartoonists or illustrators, collage artists, musicians, poets, writers, actors, dancers, arts n crafters, cooks, bakers, chefs, beauty experts, love advice, comedians, bloggers, vloggers, filmmakers, fashion designers, gardeners, herbalists, healers, mind & body experts, travelers, adventurers, philosophers, people who are fighting for a cause, people who beat the odds, people who are inspiring, people who have changed their lives for the better and want to share their stories. ANYONE who has something interesting to share with our readers, who would have a positive influence on the human spirit! Not an artist? No Worries! You can be a journalist for Abra-zine! Conduct an interview with an artist or creative folk mentioned above, or write an article about something that inspires you! 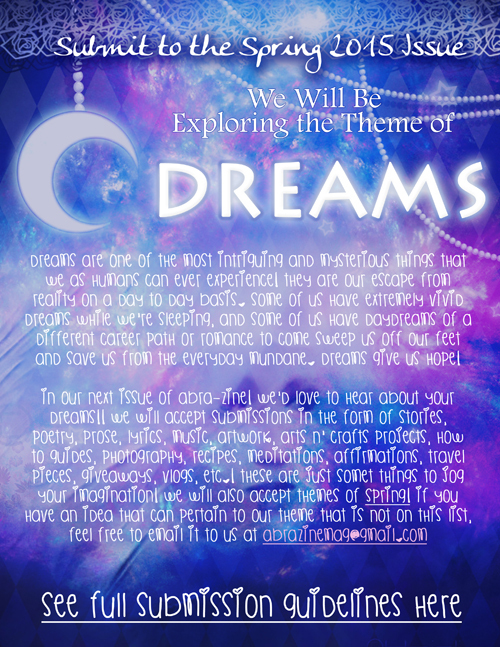 Want to submit something for our next issue? Want to post an ad in our next issue? Please download our Ad Submission Guidelines! Buy your ad space now for just $5!